WINGS OVER WARWICKSHIRE serves as a detailed account of interesting aircraft movements both over the Warwickshire countryside and also details of visiting aircraft to local airfields,the intention from the beginning was to collate and publish hard to find information as an ongoing archive for aviation enthusiasts and to promote flying in this area. 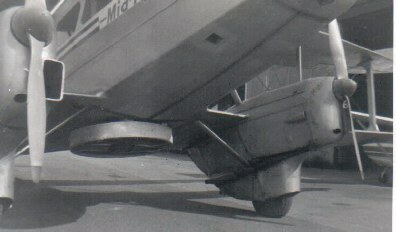 Note the very unusual positioning of the standard R.A.F cockades (roundals) very inboard of the wing,it is quite possible that this was to help the aerodynamic properties of the critical wing. 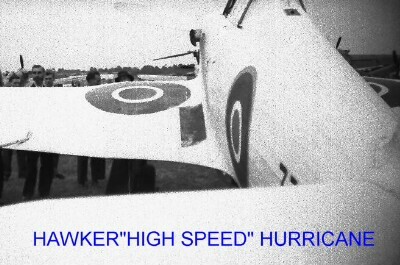 Photograph was taken at Farnborough on 24-09-47 by Mike Buck. THE HISTORICAL ARCHIVE will cover interesting facts about aircraft that have appeared in this area over the years and combined with the present day material will serve as a unique record of historical information that has not been published anywhere before,much of this material was gathered first hand. I make no excuses for the poor quality of this unique old photograph of Whitley airfield,Coventry taken in the 1930's,in the photograph you can see an Avro Cadet,Klemm Swallow,Arro Avian,the tail of a Gipsy Moth and not visible in this particular picture is a Cierva Autogyro,the picture was probably taken at an early flying meeting organised by the Coventry Aeroplane Club under the aegis of Major Dono a well known founder of this club who was also responsible for the formation of 8F Squadron Air Training Corps which commenced operations here at Whitley aerodrome. One of the many Tiger Moth aircraft which saw ROYAL NAVY service was NL879 which went on to become G-AVPJ in civvie street,the aircraft which has seen a very interesting history is currently owned by Tony Hooper and Cathy Silk and flown from a strip in Warwickshire,it is shown here at Lee On Solent with a Supermarine Sea Otter in the background. Photograph via Tim Crowe and supplied by Tony Hooper. As she appears today in civil guise as G-AVPJ photographed at a vintage aircraft club rally by Dave Peace alongside a Piper L-4B Cub G-BBUU which was rebuilt by John Pothcary at Shoreham. In1983-85 I used to help keep a Cessna 170 G-BCLS flying from an airstrip called Shotteswell ran by a great flying enthusiast Fred Spence who flew for a bank based in Guernsey,I spent many happy hours there messing about with aeroplanes.At that time regular vintage aircraft rallies were held at the airstrip which is located near Banbury,this is where this photograph was taken of Tony Hooper about to take off in T-6G Harvard G-BGHU which landed here 1.7.84. The aircraft had quite a chequered history being ex Portuguese Air Force FAP.1707 and prior to that French Air Force 115042,the aircraft seen here painted as 'Curly' was sold shortly after these photographs were taken. The machine was normally kept at Wellesbourne airfield but spent some time outside at Coventry airport. This one is for Harry Fanshawe who owned this splendid Percival Proctor 3 G-ANPP and flew it extensively from Baginton in the sixties,Harry made an extraordinary flight to South Africa in her and on one occasion landed in a small field in France when he got caught up in fog,the next day when the fog cleared it was apparent how lucky he had been,the airfield was only over the fence! the aircraft had to be dismantled and taken by lorry to the airfield much to the consternation of the local French police.We often talk about this aeroplane which he took me for flights on occasions,the photograph was taken on 25.4.68 when Ace Freighters operated from Baginton,note the L-749 Constellation in the background.The aircraft was sadly damaged when it caught fire whilst being started up following some maintenance work (probably due to being over primed) and the centre section was damaged in the ensuing fire,the aircraft was then sold to Charles Boddington who was shortly afterwards killed in a flying accident whilst doing stunt flying in the film 'Darling Lille' which its only claim to fame was that it was a box office flop! it is understood that the aircraft then went to Duxford but has not been seen since,if anyone knows its present whereabouts then we would love to hear from you and get re-aquainted as she was a very special aeroplane. Sometimes referred to as the ANSON but not strictly true as the true Ansons were early Mk 1 aircraft with wooden wings,the series 19 and 21 types were a new aircraft designed to meet the needs of the post war RAF,the series 1 of the Avro 19 had parallel chord wooden wings and the series 2 had new increased span tapered chord wings,this is the basic identification feature.The Australian civil aviation authorities would not issue any more certificates of airworthiness to Anson 1 aircraft from 1952 and the British authorities followed suit in 1962 due to some accidents attributed to glue failure on the wooden aircraft in Australia,the glue scares spread to many aircraft including Miles Magisters,Percival Q6 and Proctor,Miles Messenger and other types,the problems lay with a beetle type of adhesive used for wartime production of aircraft which was said to deteriorate especially in damp humid conditions,despite the use of resorcinal resin adhesives a lot of valuable aircraft were scrapped off which on reflection was totally uncalled for as the full potential problems of the adhesive failures were unfounded. 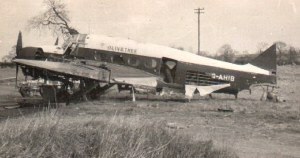 This aircraft was photographed at Wymeswold 12.3.62 by Dave Peace,with c/n 1317 it was built in 1946 and last registered to Pomeroy Developments Ltd,Guernsey although it is shown here in the colours of Olivetree Estates Ltd and doped green and white,the final demise of this aircraft was probably due to the aircraft having wooden wings as shown here in its final resting place and the date ties in with the British authorities concern over early versions of Anson aircraft and their beetle glue construction. G-AHKX Avro 19/2 constructors number 1333,ex Smiths Aircraft Instruments aircraft hack was built in 1946 and shown here in Treffield Aviation colours (Treffield was the amalgamation of the names Lord Trefgarne and Charles Masefield) colours were a pale blue/green almost a duck egg shade.The aircraft survived and is now at Woodford on restoration. G-AGWF Avro 19/1 c/n 1287 was built in 1946 and operated by Fairways (Jersey) Ltd.
VM318 Avro 19 at St Mawgen in 1960 when it was part of the station flight at the airfield,note the tail of a Canadair CL-44 in the background probably visiting for one of the stations at home displays. G-AGPG Avro 19/2 c/n 1212 was built in 1945 and used by Ekco for research and as an hack aircraft ,photographed at Baginton circa 1963-64 note the bulbous nose modification for the experimental radar,this was actually the second Avro 19 used by the company they having used G-AHKX also for some years although not with this type of nose.The aircraft went onto the Historic Aircraft Museum at Southend and is now in store with the Manchester Aviation Museum. G-VROE (G-BFIR) AVRO 652A ANSON C.21. 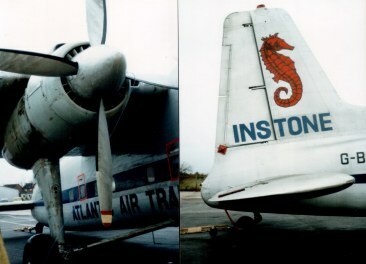 This is the aircraft preserved in flying condition by the Air Atlantique Historic Flight and kept at Baginton.Flown for many years by G.M.K Fraser and based at a variety of airfields in the UK terminating at Enstone were it was stored for a while with its former RAF serial WD413 the aircraft at one time was a maintenance aircraft with the serial 7881M although the official quoted c/n of 3634 is incorrect and suspect.The aircraft has been kept at East Midlands,Lee On Solent,Turnhouse,East Fortune in recent years and had been used on the airshow circuit for many years by Mr Fraser. picture credit-Dave Peace at Birmingham Airport. 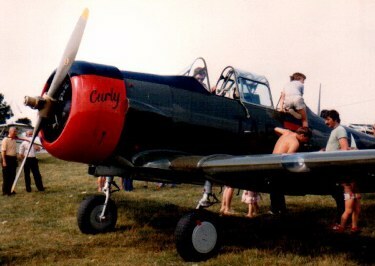 The very same aircraft at Enstone airfield,Oxfordshire on 6.2.93 prior to its sale shortly afterwards to Air Atlantique when it was registered as G-BFIR and flying in its RAF colourscheme as WD413,it was ex maintenance serial 7881M. VH-ASM anson 1 This is a true Anson Mk 1 used by Marshalls Airways at Tamworth NSW,Australia ,this aircraft has been shipped to the UK and after a spell at Duxford is now on display in the RAF Museum painted as an RAF example with serial W2068 which is its former RAAF serial. G-AMDA Avro Anson 1 picture shows David Ogilvy putting G-AMDA/N4877 coded FV-X through its paces at a Skyfame Staverton airshow in the seventies,the aircraft was built in 1938 with two Armstrong Siddeley Cheetah 9 engines and became part of the Derby Aviation magnetometer fleet which together with civilian Mosquitoes performed extensive research work for minerals in Canada. On the demise of the wonderful Skyfame museum which was way ahead of its time and started by Peter Thomas and his wife the aircraft were transferred to Duxford where they carried on the work of aircraft restoration with the Imperial War Museum collection. The latest on this aircraft is that it is undergoing restoration by a team at Duxford. N4877 shown at Duxford on an unknown date picture by Dave Peace. A recent photograph of G-AMDA being restored at Duxford to non flying condition,a turret will be added during the work on this aircraft. This lovely early shot of G-AIPA has recently come to light,it clearly shows the underslung magnetometer equipment in the form of an ECM Bird which was trailed behind the aircraft,note also the legend 'Canadian Aero Services' on the nose. VL337 Avro Anson T.Mk 21 final RAF Anson flight. 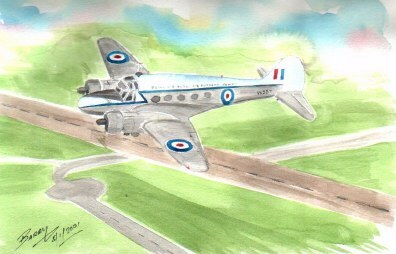 The aircraft shown here represents the final Anson flight when it was retired with the RAF in 1957,a farewell flypast was made over various RAF stations including Northolt shown here. This example G-APHV was operated extensively by BKS Air Surveys in the 1960's,shown here at Elmdon on 9.4.61 minutes after myself and Dave Peace had flown in the Proctor 5 G-AKYA which is just visible behoind the Anson,the Proctor was sold in Jordan in September 1962 and the Anson was painted as VM360 and is believed to be still extant. is Avro Yeadon built and was at Duxford on 15.10.95 when this photograph was taken by Dave Peace,it has since been moved to Baginton to provide spares for the Air Atlantique Historic Flight aircraft G-VROE. This Midlands based Avro 19 was on the Station Flight at RAF Gaydon in the sixties at the time 230 OCU the V-Force flew Vulcans,Victors from here,they had some great at home days and this was when this picture was taken by Dave Peace on 15.9.62,I remember joining the queue to see inside this aircraft and speak to the pilot,those were heady days! Twenty eight years separate these two photographs of big Bristol twin engined freight aircraft both taken at Baginton airport,in actual fact they are two different types of aircraft the aircraft above is a Bristol 170 Freighter 31M G-BISU and the aircraft below is non other than the true prototype Bristol 170 Wayfarer prototype aircraft G-AGPV for all the later versions,note the rudder fillet on the one above added to improve directional stability and the opening front nose doors which were not a feature of the Wayfarer prototype. The picture above was taken on 21.10.87 and the one below on 9.3.61 and a separate history is given below of these two fascinating aircraft. G-AGPV Bristol 170 Wayfarer (series 1 later converted to series2) operated by Trans European Airways,Baginton. Trans European Aviation was a unique company formed by Captains Stauber and Ross moving to Baginton airport in 1960 from Fairwood Common airport, bringing with them two Dragon Rapide aircraft G-AFFB and G-ALBA,with which they gave pleasure flights at weekends at nearby Elmdon airport,the two aircraft would fly over every available opportunity in formation and gladly take young enthusiasts with them like myself for the ride over to Birmingham.The company developed very quickly and started to do ad-hoc charter work with the Rapides but soon something larger was required and this is where the Bristol 170 Wayfarer came in.In 1946 a requirement for an Air Ministry specification C9/45 the prototype flying shell G-AGPV was converted for the Air Interceptor radar tests at the Royal Radar Establishment at RAE Defford flying as VR380 together with its sister aircraft G-AGUT which became VR382 the aircraft were delivered to Defford on 24.9.46 and a few days later set to work in the Telecommunications Research flight there,G-AGUT was actually the fourth prototype with Bristols and for their Air Ministry trials had previously worn serials VK900 and VK903 respectively.Once their work had been completed and in 1958 they were both taken to Blackbushe airfield where G-AGUT was broken up to provide valuable spares to get G-AGPV airworthy for the civil market and was taken over by Trans European Airways at Baginton,its life with the company was to be short lived as it was retired by the company in 1963 and scrapped by the company in 1965 at Gatwick. A few words about the early life of this aircraft as like most prototypes of its day it was merely a flying shell to test the aerodynamics of the aircraft,G-AGPV was without the nose loading doors and strengthened floor of the later versions but it had additional windows and a small crew door in the front of the fuselage,the aircraft made its first flight at Filton on 2.12.45 and first test flights showed a need to lower the tailplane by three feet and increase the wingspan by four feet until these modifications had been incorporated the aircraft could not be flown hands off,it is interesting to note that whilst in Trans European service the fin still did not have the dorsal fins fitted of later aircraft as severe structural failure to the fin had occured whilst in a single engined climb causing two crashes one in the English Channel and one at Llandow in 1949 and 1950.
photograph above by Dave Peace. 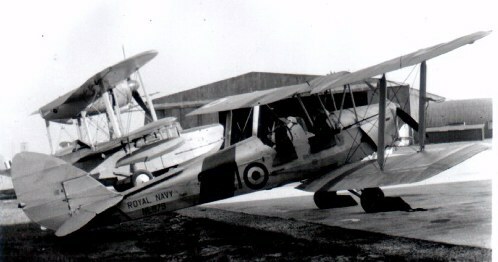 This early Bristol Aeroplane company photograph shows the aircrafts original round portholes which were an early recognition feature of this particular aircraft,it appears that although the aircraft never had the dorsal fin fitted the portholes must have been modified at some later date,note also the mudguards fitted to the wheels. 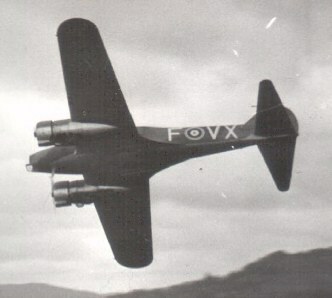 Bristol Wayfarer G-AGPV wearing military serial VR380 and fitted with underwing stores,still with the portholes but minus the mudguards,the aircraft was later fitted with a nose radome for the Malvern tests. G-BISU was operated on behalf of the racehorse company Instone by Air Atlantique from Baginton airport in the period 1986-87,it started life as G-18-194 which was its 'B' Class test registration used by the Bristol Aeroplane company at Filton,the aircraft then went to the Royal New Zealand Air Force as NZ5912 on 17.3.55 operating for a while as ZK-BVI until returning once again to NZ5912 and used by 41 squadron at Tengah in Singapore it was then resold as ZK-EPH on 4.81 and later came to the UK as G-BISU with the aforementioned Instone Air Transport operating initially from Gatwick and then Baginton with a joint operation with the newly formed Atlantic Air Transport,in 1988 it went to Duxford for temporary storage pending sale which eventually transpired to Trans Provincial Airlines in Canada and being registered as C-FDFC serving as a mining support aircraft,other aircraft in the fleet were lost in take off accidents,once a ground loop developed with these aircraft it was difficult to correct.In September 1994 the aircraft once again returned to the UK wearing its Canadian registration it was stored for a while at Heathrow having been purchased by a group of British Airways pilots and eventually moved to Enstone airfield in Oxfordshire following an hardstanding which was specially built for her there,it made a few special appearances including that years Popular Flying Association rally at Cranfield circling for over an hour while a damaged aircraft was removed from the runway there.Tragically the dreaded swing developed whilst taking off from Enstone on 18.7.96 intending to go to a Bristol aircraft show at Filton and later to go onto the Royal International Air Tattoo at Fairford,however it was not to be as the aircraft had swung heading straight towards some aircraft hangars and corrective action had to be taken quickly,however the aicraft broke in two and was never to fly again,all on board escaped with a few bruises.The nose section remained at Enstone for some years later until eventually scrapped. 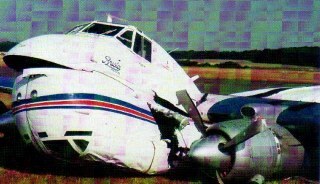 Sad end to a lovely aircraft,pictured after the unfortunate take off accident at Enstone on 18.7.96,despite over 800 gallons of fuel on board it never caught fire. 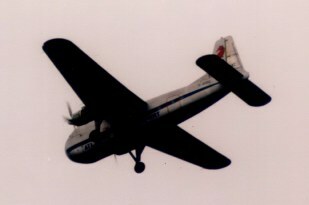 This photograph was taken when the aircraft was entered in the 'Great Air Race' at an Air Atlantique air show held at Baginton in 1986. G-BISU detail shots at Baginton. Photographer unknown,I would love to thank the person who took these pictures at Filton probably in the fifties,they depict the one and only Mk 31C version which was produced especially for the A& AEE at Boscombe Down in 1955. XJ470 was built with constructors number 13217 and initially flown in 1955 with the Class B test registration G-18-193 before being given its more permanent serial for delivery by the manufacturers to Boscombe Down on 18.2.55 for overseas liaison and freight duties.On 4.10.55 it was returned to Filton for retrospective embodiment of various modifications,it then went back to Boscombe on 17.11.55 to continue with the same tasks. On 26.10.64 the aircraft was allocated to what had by then become the British Aircraft Corporation (Operations) Ltd,Filton Division,and on 19.11.64 flew to Weston-Super-Mare for the company to carry out major servicing.It went back to Boscombe Down once more on 11.6.65 once again for continuation of the previous tasks,it was finally released by the & AEE on 6.5.68 and was officially struck off charge on 2.10.68.It was then allocated for scrap,being despatched to Staravia Ltd at Ascot on 30.12.68. The photographs above can now be credited to K.J.Alderman,Bristol. 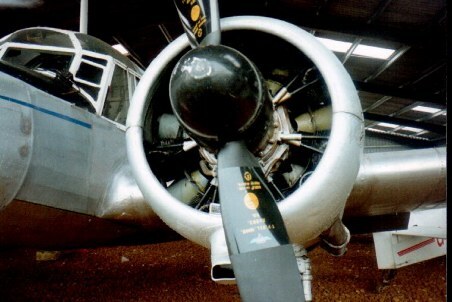 This aircraft was based at Changi with 41 squadron and was the same batch as NZ5912 (G-BISU) and probably painted in camouflage as most Bristol Freighters that served here did,the aircraft is a Mk.31M which was a dual trainer,the aircraft was delivered on 9.4.54 to the Royal New Zealand Air Force and was known to be still in use by them in 1970. Much enlarged photograph originally taken by L.Botley. This is a Mk.31M delivered to the Royal Canadian Air Force on 29.6.55 as 9699 with constructors number 13219,it was later sold in 1968 and delivered to Wardair as CF-WAE and was active at least up until 1969. This aircraft was delivered as S4402 (constructors number 13155) to the Royal Pakistan Air Force on 22.12.53 as a Mk.31M,it was sold after conversion to a Mk.31E to Safe Air as ZK-CAM and was known to have been active until at least 1969. THE CIERVA C30A AUTOGIROS-A personal reminisance of these amazing flying machines. The take off in itself is effected exactly like that of an aeroplane.One may dive and climb at will,make vertical turns,and so on.The autogiro flies exactly like that of any aeroplane.The real sensation that I experienced was in landing.Cutting off the motor 1,000 feet directly over the field,I pulled the sytick backand proceeded to fly,on my first landing,about thirty miles an hour coming into land.The descent was about an angle of 45 degrees and on touching the griund I did not roll more than ten feet without any application of the wheel brakes whatsoever.I took off again and landed to become accustomed to this strange craft .It intrigued and thrilled me. I now had enough experience to attempt a more vertical descent.....it is quite a sensation for a pilot who has been flying a fast aeroplane that lands between 60 and 70 miles an hour and that must be manoeuvred carefully into a field,making sure his judgment is accurately managed,to step into a machine and fly right over the centre of the field ,shut off his motor and then drop right straight down into the circle which marks the centre of airports. 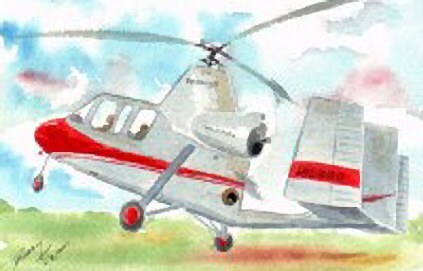 To recreate my memories I have to resort to my sketchbook and portray what it looked like in the air,here are two paitings that I have made of each of the Elmdon Cierva C30A autogiros as they would have appeared,firstly is G-AHTZ which had a rather tragic demise when it turned over and caught fire right in front of the then Lord Mayor of Birmingham on 4th March 1958,this aircraft was formerly G-ACUI of the autogiro fying club and served in the RAF as HM581. The other autogiro which was present at Elmdon was G-ACUU which was owned by Guy Baker who flew her on occasions,this aircraft was ex Air Service Training at Hamble and was exhibited at the 50 years of flying exhibition held at Hendon in 1950,it went ot Skyfame at Staverton and then onto Duxford where it still resides. G-ACUU Cie.rva C.30a shortly after delivery to the Skyfame Museum at Staverton in 1960. 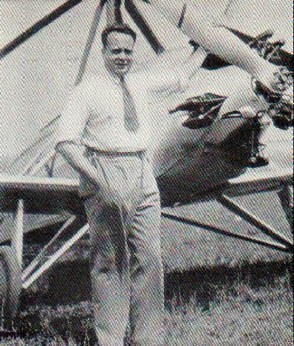 Became HM580 9.42,restored 3.12.46 as G-BCUU,withdrawn from use at Elmdon 4.60.
shown here besides one of his Autogyros was killed at Croydon in the take off crash of a KLM DC-2 PH-AKL on 9.12.36,after this tragic set back the development of the Autogiro gradually came to an end,the name Cierva however was later ressurected in the form of Cierva Rotorcraft at Redhill to produce the Rotortec Grasshopper. 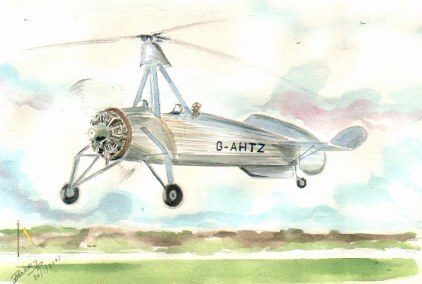 G-ABTO Comper CCierva C.25 Autogyro. Cierva commissioned the Comper Aircraft company to produce this sporting single seater autogyro at Hooton Park in 1932,fitted with a 85 hp Pobjoy R radial it was flown by Flt Lt Nicholas Comper for demonstrations at Heston and Hanworth on 27.4.33,it did not last long after this however as it was written off in 12.33. From a painting by Barry Clay. 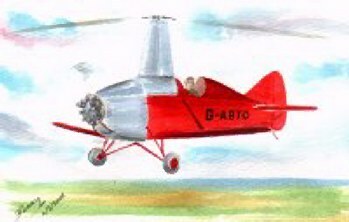 Certain modern designers have been quick to recognise the qualities of the Autogiro and one such machine was the Umbaugh range built in the USA,at least one found its way onto the British Civil register but was damaged in a landing accident. Since the above painting was put on my site additional information has come to light regarding this fascinating machine,here it is-Three aircraft were registered in this country,G-BALB,G-ATZT and G-AYUE out of these G-ATZT c/n 18-36 was never imported and G-AYUE was damaged beyond repair on 21.5.71 this was ex N6150S and became the victim of a landing accident at Membury airfield whilst being operated by Campbell Aircraft Ltd. The remaining aircraft G-BALB which was built in 1966 was imported by Interflight Ltd and was ex N6170S it is interesting to note that this gyroplane was demonstrated to the Metropolotan Police forces and made a number of landings at Battersea heliport,its top speed was 85 mph and it had a range of 300 miles,its down side was its noise which despite modifications was never really solved,the Civil Aviation Authority did not help matters by imposing a number of very expensive modifications to the aircraft before a British certificate of airworthiness would be issue,the gyroplane was knbown in this country as the Air And Space Gyroplane,G-BALB the final one was seen covered in dust at Biggin Hill airfield early 1985 after beingy withdrawn from use in May 1974. 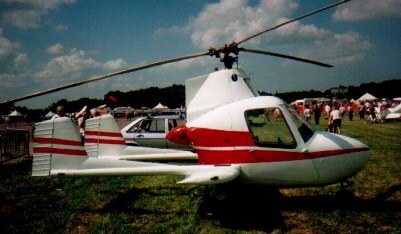 This is the McCulloch J2 G-0RVB which for a while served with the Bahrain Public Security as BPS-3,it was registered for a while in the United States as N4329G and made a public appearance at the Popular Flying Association rally at Wroughton in 1991.Kept for a while at Baginton it migrated to Bruntingthorpe but its current status is not known. 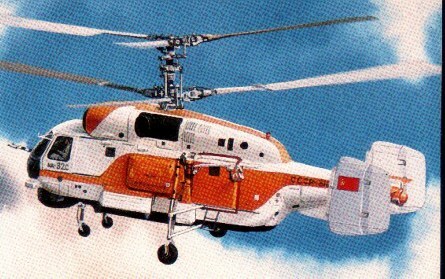 The Russian KA32 contra rotating helicopter makes a useful utility helicopter with its good lifting capability. 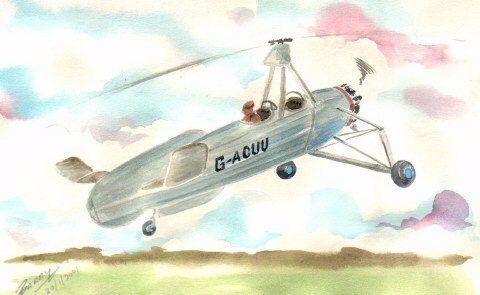 And now for my flying model autogyro produced so that I can recreate rotary flight- GYRACE CONTRA ROTATING AUTOGIRO. FLASHBACKS TO YESTERYEAR-Airspeed AS.57 Ambassador 2,G-ALZT. The magnificent lines of the Airspeed Ambassador which was called the Elizabethan in British European Airways service are captured here in this photograph taken at Baginton circa 1965-66 whilst operating a charter.Powered with two Bristol Centauras 661 engines this one was built in 1952 and operated by BKS Air Transport (the name BKS was derived from Barnaby,Keegan,Stevens who formed the airline).The aircraft was withdrawn from use in 1968. As can be seen I enjoyed unlimited ramp access at the airport at that time when I worked for Light Aircraft Servicing Ltd (Ray Turner) and only wish that I had the same freedom thesedays,airport authorities please take note! so many good photographic opportunities are lost to record interesting movements. I experienced my first aeroplane flight in this machine which was owned by Luton Airways.The flight was a birthday present from my Father and took place at an airshow at Baginton on 11.6.59,the aircraft was originally registered in Iraq as YI-ABT and more than likely was part of the Iraq Petroleum Transport fleet who operated a lot of these aircraft until replaced by De Havilland Doves.Aircraft is c/n 6906 and was cancelled 28.2.73,its sister aircraft was G-AIBB which was sold as F-OBVJ 8.61. Certainly one of the best attempts to preserve a Rapide in RAF markings as a Dominie (service name) G-AHGD is actually ex RAF NR786 but marked here as Z7258 which was a famous aircraft named 'Women of the Empire' provided by public funds as an Air Ambulance.The aircraft was owned for many years by L.H.Riddle an engineer from Harrogate in Yorks and tipped onto its nose at Woburn Park during a fly in in the late 1950's but changed hands a few times before being based at Old Warden. 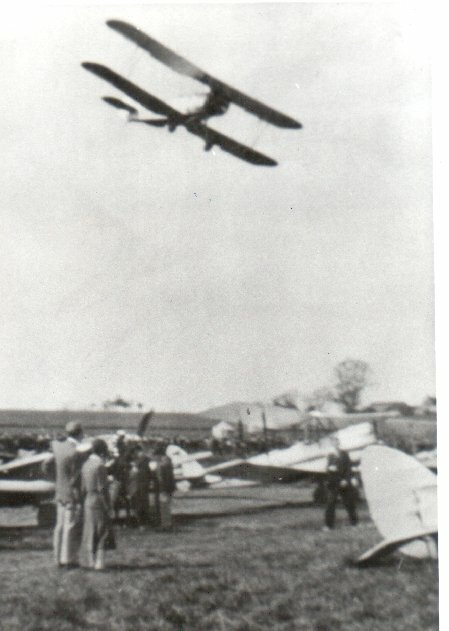 The aircraft was a regular visitor to the Royal Show in Warwickshire and landed at Baginton for its stay.,sadly the aircraft is no more as it was involved in a tragic fatal accident when a seat buckle became entangled in the flying controls during an airshow display at Audley End. photograph by Barry Clay at Baginton 3.7.84. Another interesting Phoenix aircraft which visited Baginton on 21.10.91 to transport a consignment of young calf,the subject of much controversy amongst the animal rights movement,and an unfortunate sequence of events leading up to the tragic crash of a Boeing 737 Freighter 7T-VEE on 4.11.94,on the threshold approach over Willenhall in bad weather,needless to say the flights terminated after much grief and tragic loss of life. To the memory of those people I dedicate these photographs. Flashback to troubled days at Baginton and in some ways the start of the hostility to enthusiasts which has brought about paranoid security measures at the airport in recent years. 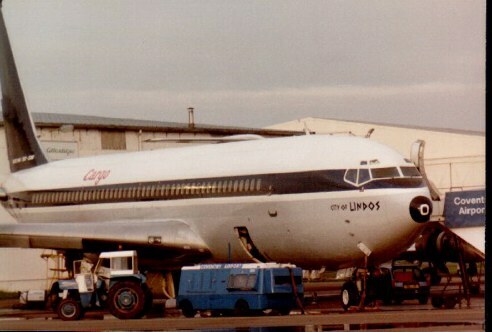 The controversial veal flights operated by Phoenix Aviation were flown by many interesting and evasively marked aircraft,one such aircraft was this Boeing 707 series 320 a former Olympic machine shown here on 11.11.89,note the non descript 'Cargo' titling. 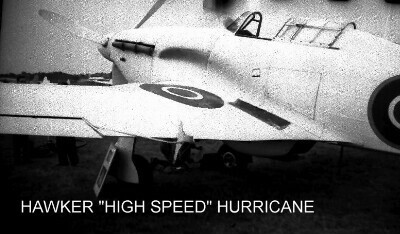 Fast becoming an extreme rarity in British skies is the Miles Messenger,designed by F.G.Miles and built at factories at Shoreham and in Ireland,one aircraft became the personal mount of Field Marshall Montgomery in the second world war and was landed on roads and small fields. This aircraft G-AKIN has been operated by A.J.Spiller for many years originally based at Sywell and now lovingly kept at a strip at Keystone.This picture was taken at a fly in at Shotteswell on 1.7.84. I think it would be safe to say that I can claim part of this aeroplane as I spent hundreds of hours rebuilding her to flying condition in 1963,photographed here at Baginton in 1963-64 when owned by Ray Turner of Light Aircraft Servicing who learned to fly in her. The chequered history of this aeroplane is impressed into RAF service as AV952,sold in Pakistan and based at Dacca as AP-AES and came back to the UK for overhaul,sold in Germany as D-EJOM in 1957 crashed on delivery and once again returned to the UK to be rebuilt again. 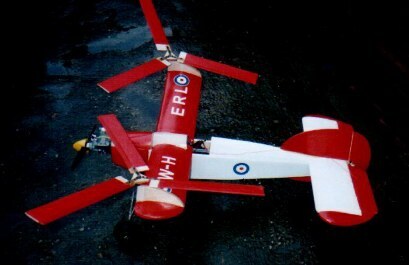 Flown from Cryfield Grange farm in Kenilworth and crashed on take off causing extensive airframe damage,went South and used as a spares source for the rebuild of G-ADLY by Peter Franklin. This photograph has just been discovered which shows G-ADSK taken at the Cryfield Grange strip near Kenilworth,the colours at this time were pale grey with blue trim,the photograph was taken by Gerald Walker.